Earlier this year, we wrote about leveraging the Power BI REST APIs to create real-time dashboards in Power BI. Ever since, we’ve seen thousands of Power BI users engage with our real-time capabilities. Today, I am happy to announce the preview availability of functionality which makes it even easier to stream real-time data to Power BI, and to see that data light up in your dashboards. Designed for easy setup, these new features show our commitment towards allowing our users to quickly gain insights from data of all shapes, sizes and velocities. Real-time data empowers users to make quick decisions on time-sensitive information, and to identify emergent trends as they happen. Recently, we’ve seen an explosion of powerful real-time use cases – from factories using IoT sensors to monitor their equipment, to media agencies monitoring their social media campaigns as they go viral. Power BI further amplifies the power of real-time data with an easy setup process, and an array of powerful visualization and analysis tools. With that in mind, we are introducing real-time dashboard tiles – a lightweight, simple way to get real-time data onto your dashboard. Real-time tiles can be created in minutes by pushing data to the Power BI REST APIs or from streams you’ve created in PubNub, a popular real-time streaming service. Let’s jump in! 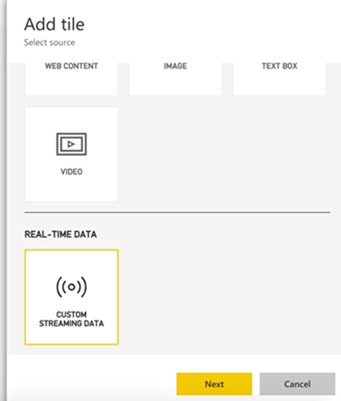 To get started with the new real-time features, create a streaming dataset. Go to a dashboard, choose “Add a tile”, and select the “Custom streaming data” option. Choose the “manage data” link to get to the streaming dataset management page. On the streaming dataset management page, choose "Add streaming dataset" in the top-left, and you'll see a number of options. Below, we'll dive into each option in detail. PubNub is a real-time data streaming service used widely for building web, mobile and IoT applications, powering millions of devices across the globe. 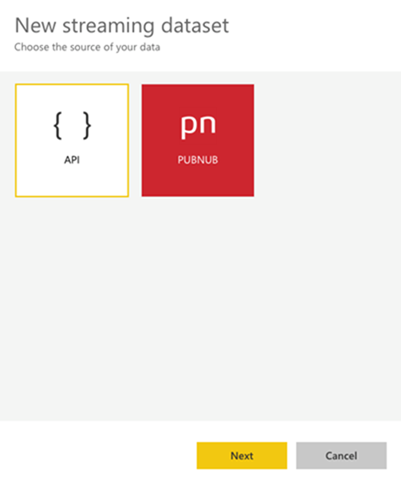 With Power BI's new PubNub integration, you can connect your PubNub data streams to Power BI in seconds, in order to create extremely low latency visualizations on streaming data. To add a streaming dataset via PubNub, choose "Add streaming dataset" and select the PubNub option. In the next dialogue, provide your PubNub Dataset name, Sub-key, Channel name, and PAM Auth Key (if applicable). if you're not sure what these are, sign into your PubNub account, and go to the PubNub Admin portal. Streaming datasets are designed for quickly getting real-time data onto your dashboard. If you’re looking for analysis or alerting on your real-time data streams, we suggest you integrate your PubNub data stream with Azure Stream Analytics, and from there output to Power BI. Stay tuned for more on this in future blog posts! We're proud to introduce improvements to the existing Power BI REST APIs designed to make the developer experience of streaming real-time data to Power BI even easier. To get started with the real-time API, choose "Add streaming dataset" and select the API option. Provide the dataset name, as well as the list of values that you want to send. You'll also be asked whether you want to enable historic data analysis. Enable this option if you want Power BI to store the data sent via the APIs for use in reporting and analysis down the road. Upon successful creation of the streaming dataset, you'll be given a REST API URL endpoint. Your application can make HTTP POST requests to this endpoint in order to send data to the streaming dataset. See our sample app for a demonstration. From here, you'll be able to add real-time visualizations to your dashboards, backed by your new streaming sets. The power of real-time data, combined with the 60+ data sources already available in Power BI, allows you to create a truly 360-degree view of your business. Excited to get going? Here are some additional resources to help you get started. Need sample streaming data? Check out PubNub’s real-time data stream examples, or our sample app on GitHub, which pushes data to the Power BI streaming APIs. Leave us feedback on UserVoice! We’d love to hear any ideas, comment or questions that you might help. Together, we can push the boundaries of real-time data visualization and analysis!